Utilization of a concrete core system in office buildings can achieve significant cooling energy savings. Although this technique is widely used for the purpose of cooling rooms, utilizing it in humid climate regions can be critical for surface condensation problems. A promising approach to the surface condensation control is Model Predictive Control (MPC). In this study, MPC based surface condensation control framework is presented. The dynamic model was developed based on existing heat and moisture transfer models, and the developed model was calibrated with experimental data. The curve fitting process was adopted as a calibration method. With the curve fitting process, a gap between measured data and simulated data is minimized. The most probable physical parameter values were then derived from the best fit curve, and input into the dynamic model to generate the surface condensation prediction chart. By integrating the surface condensation prediction chart into the MPC framework, the risk of surface condensation for the following day can be estimated in advance. 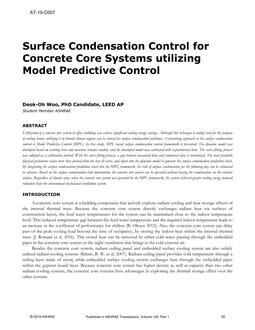 Based on the surface condensation risk information, the concrete core system can be operated without having the condensation on the concrete surface. Regardless of climate zone, when the concrete core system was governed by the MPC framework, the system achieved greater cooling energy demand reduction than the conventional mechanical ventilation system.